Are stamps still important in a digital word where letters can be sent at the click of a mouse or tap of a finger? Judging by the fact that people from all over the world are gathered in the hundreds of thousands in New York this week for the World Stamp Show 2016, yes would be a correct answer. While “snail-mail” is not as common a thing as it once was (sadly), stamps are still considered important by collectors, exhibitors, postal administrators, and of course those of us who still write and send letters. And this is as true for African rock art stamps, as for any other. “Despite their small size, stamps have a more concentrated ideological density per square centimetre than any other cultural form” David Scott states in his book on European stamp design. 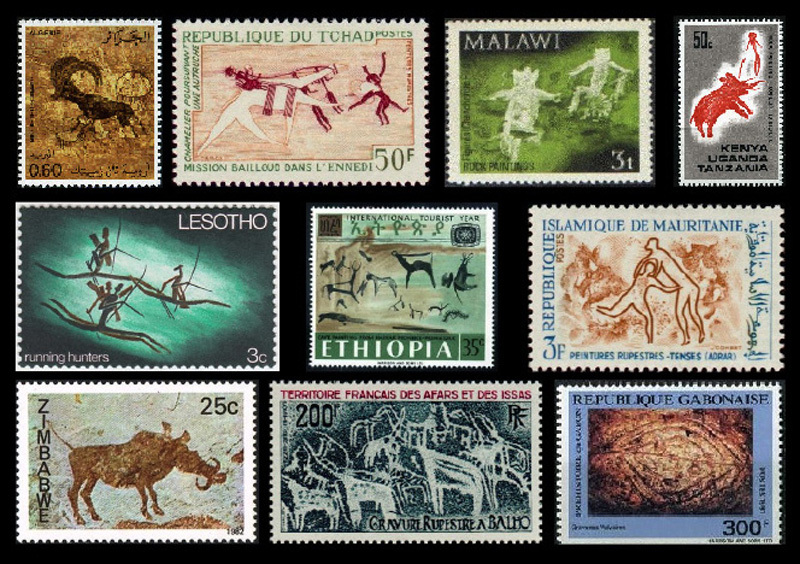 And stamps have been a cultural form of choice for African countries from Algeria to Namibia, who have chosen this way to showcase and popularise their rock art heritage. In some cases where a country’s idea of itself has had rock art at its root, such as in South Africa, rock art images have not only appeared on postal stamps but also on currency and state insignia, all of which are public imagery. When letter sending was more common, stamps bearing rock art were ambassadors for rock art, reaching far off places to spread awareness of this heritage. In more recent times, such stamps have become collector’s items. It is possible to acquire rock art stamps from various dealers online for private hobby collectors. Rock art stamps are also an educational resource on heritage where images or other access to rock art are impossible. That said, however, governments and postal institutions continue to issue postage stamps. Perhaps a renaissance of rock art on stamps is due (as is a renaissance of letter posting, the slow way). Hiring: Communications officer & bilingual intern! Website lovingly built by Creative Engine.